US President Barack Obama is to miss the memorial to boxer Muhammad Ali on Friday because it clashes with his daughter's high school graduation. World leaders will be among thousands attending Friday's procession and memorial service in Louisville, Kentucky, where Ali was born in 1942. The White House said Mr Obama and his wife Michelle will be at daughter Malia's graduation in Washington, DC. Ali died last Friday at the age of 74 in hospital in Phoenix, Arizona. The Obamas will send a letter to the Ali family with White House senior adviser Valerie Jarrett, who knew Ali. 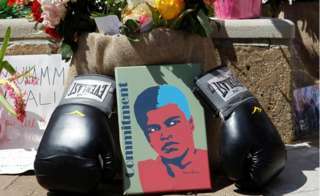 Bob Gunnell, a spokesman for the Ali family, said Mr Obama and Ali's widow Lonnie had spoken by telephone. Among those attending will be the President of Turkey, Recep Tayyip Erdogan, and King Abdullah of Jordan. British former heavyweight champion Lennox Lewis and actor Will Smith, who once portrayed Ali on screen, will be among the pallbearers. Former US President Bill Clinton and actor Billy Crystal are also set to speak. After Ali's death, Mr Obama said he kept a pair of his gloves in his private study below the photograph of Ali beating Sonny Liston in 1964. Ali would be remembered, he said, "not just as skilled a poet on the mic as he was a fighter in the ring, but a man who fought for what was right. A man who fought for us." On Thursday, a traditional Muslim funeral service will be held at the 18,000-seat Freedom Hall, where Ali fought and won his first professional fight in 1960. People queued from the middle of the night on Tuesday to get the first tickets. "I am here to get tickets for my grandson. He is eight," Angela Smith Ward, a former Army employee, told Agence France-Presse. "I want him to know that you can be great no matter where you come from." On Friday, from 09:00 local time (13:00 GMT), the coffin will be taken on a procession through the streets of Louisville, passing by locations historically important to Ali. Ali's funeral will then take place at a large concert and sports arena, the KFC Yum! Center, from 14:00. The service will be open to the public. The boxer will be buried in a private service at the city's Cave Hill Cemetery. The funeral will be broadcast live on the internet.